Hakuchōzan delivers the most exquisitely designed chalet experience in the world. Private chef, chalet hosts, driver - all in the the snowiest place on earth. Hakuchōzan offers a masterful design combining seven stunning en-suited bedrooms with multiple luxurious living and entertainment spaces. A truly uniquely conceived property, Hakuchōzan is designed to accommodate multiple families, be child-friendly, while also being accessible to older generations. RESIDENCE Hakuchōzan offers a masterful design combining seven stunning en-suited bedrooms with multiple luxurious living and entertainment spaces. A truly uniquely conceived property, Hakuchōzan is designed to accommodate multiple families, to be child-friendly while also being accesible to older generations. SWAN MOUNTAIN The name Hakuchōzan means “Swan Mountain” in Japanese, and originates from the owners’ personal affiliation with Neuschwanstein Castle (“New Swan Castle”) in Bavaria, Germany where the owners were engaged to be married. A DEDICATED chalet host, personal chef, and driver await to ensure each guest’s stay, from reservation to departure, is a truly 6-star experience. 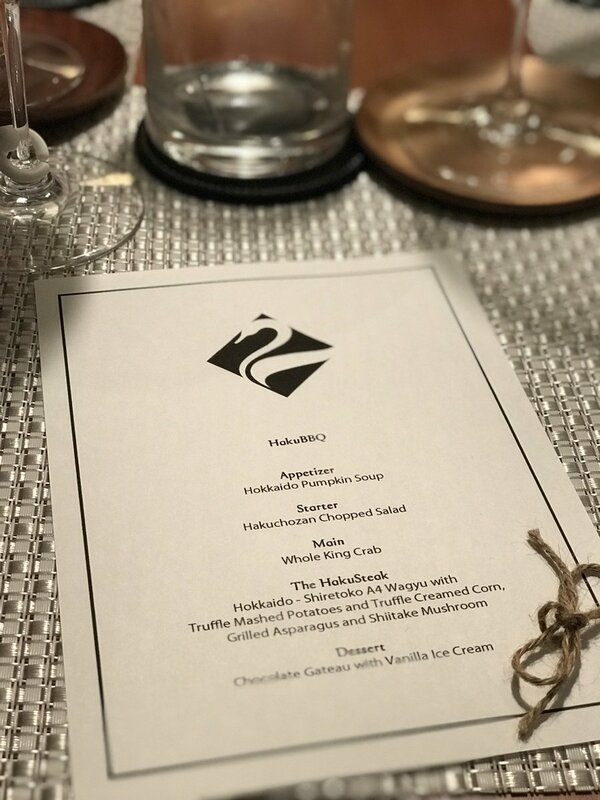 FROM custom-designed dinner parties to providing personal mountain and powder guiding, the Hakuchōzan team’s passion is to serve and anticipate every guest’s needs, and to delight them with attentive service. DISCOVER the true meaning of indulgence as you wake up to the smell of freshly baked bread, then decide which ski lift or ski resort for the private driver to take you to depending on the ski conditions of the day. Then, return from the ski mountain by private car to be greeted with mulled wine on the stove, a warm fireplace, and a masseuse to relax your aching muscles. FROM DAWN to dusk the Hakuchōzan experience is a total immersion in luxury designed for the holiday of a lifetime. Every guest leaves Hakuchōzan feeling that their stay was exquisitely delivered, personalized, and indescribably special. Hakuchōzan named the 2019 Winner of the Luxury Chalets of the Year Category by the prestigious Luxury Travel Guide Publication. The Hakuchōzan butler, chef and service team are so thrilled to have our dedication to delivering sensational memories for our guests recognized by others once again.